This is a beautiful campground on the Snake River near the confluence with the Clearwater River. The campsites are shaded and spacious. We camped at Hells Gate State Park in a Travel Trailer. The visitor center here is one of the best in the State of Idaho. It features Lewis & Clark Discovery Tour in Idaho. Lewiston, ID and Clarkston, WA are close by and have many places to shop and dine. There are many hiking, biking trails at the park, but they are in a sunny, treeless area. There is a nice trail along the river to some unique basalt columns. Hells Canyon is upriver, and there are jet boat tours available in the Park. The campground is in a beautiful location and is very popular. The restrooms were well maintained and clean. 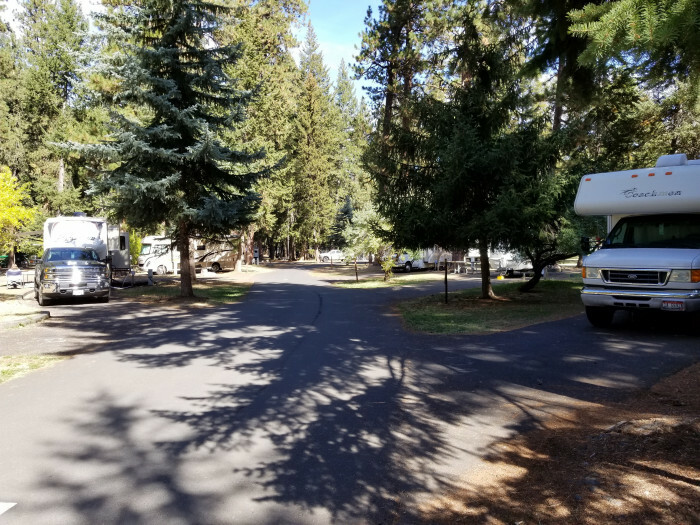 The only downside to the campground is the camping spaces are close together and there is little or no privacy from other campers. But if you want to camp in Joseph, OR, this campground is your best choice. 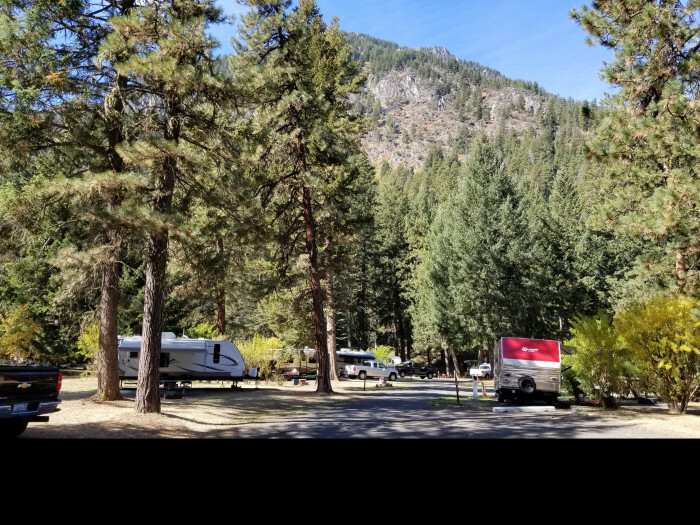 We camped at Wallowa Lake State Park in a Travel Trailer. Make your reservations early before your trip. The campground is often full. 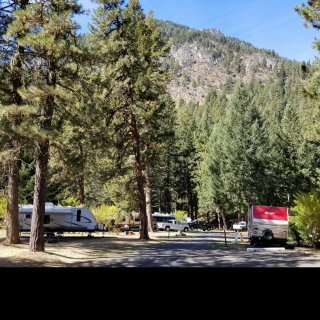 Beautiful campground on Payette Lake in the Idaho Mountains. Well maintained with many hiking, biking trails. This is a family friendly place that kids (both young and old) really love. Deer are frequent visitors in the campground. We camped at Ponderosa State Park in a Travel Trailer. This is a popular campground in the summer Reserve early. Weekends are generally full. This is a beautiful park on the Deschutes River only 5 miles north of Bend, Oregon. The campground is in excellent condition and is very clean. The hiking trail on the river is scenic and enjoyable. It is quiet at night and a good place to sit out and watch the stars. Will definitely return again when I am in the area. Reserve a spot early as sites with hook-ups are scarce on weekends. We camped at Tumalo State Park in a Travel Trailer. Large, well designed campground with level sites and clean facilities. Easy walk to beach with many trails. Helpful staff and many campground hosts. Busy place on weekends. There is only one dump station for such a large campground. Go early to dump or plan on waiting. We camped at South Beach State Park in a Travel Trailer. Lost Creek, Ona and Seal Rock State Parks are close by and worth the trip for a beautiful beach. This is one of my favorite campgrounds on the Oregon coast. It is close to many other natural attractions and nearby shopping and restaurants. Most of the campsites are in a beautiful forested area, and the nature trail is scenic. You can walk to the beach and see a lighthouse on the horizon. Many of the sites are not level, and because you are in the trees, there is a lot of dirt and pine needles underfoot. Staff is helpful and the facility is clean. Many sites have bumps due to tree roots. I will return many times in the future, but reserve early in the year for weekends are crowded. We camped at Beverly Beach State Park in a Travel Trailer. Yaquina Head Lighthouse is a good place to see seals and whales. This is an excellent campground if you like to walk the beach. Facilities are clean, and the staff (including hosts) are helpful. Quiet and beautiful. My sister stayed in a yurt which she enjoyed. There are many beautiful coastal beaches nearby. Look forward to my next visit here. We camped at Nehalem Bay State Park in a Travel Trailer. One of the cleanest, quietest campgrounds in Oregon. There are good hiking trails and lots of things to do at this State Park. Clean, beautiful and off the beaten path. Look forward to my next visit. We camped at Milo McIver State Park in a Travel Trailer. The campground is beautiful and well maintained. But, if you expect sound sleep, the horns from the trains will prohibit it. The trains run by all night with the horns blaring. I had a difficult time sleeping at this campground, and do not plan to stay here again. A fellow camper told me that he got used to it. Lots of Canadian geese reside here on a beautiful river. 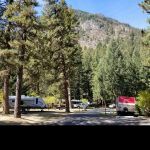 We camped at Deschutes River State Recreation Area in a Travel Trailer. The park is one of the best in Idaho, located on a pristine mountain lake. The campground borders the lake, and there are plenty of hiking and biking trails from the campground. The ponderosa pines and other trees provide a magnificent canopy and background for enjoying the outdoors. There are swimming areas and boat docks by the campground. Many deer and ground squirrels frequent the area. Park personnel are helpful and courteous. Reservations are a must for weekends. 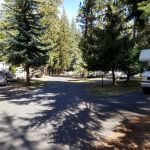 We camped at Ponderosa State Park in a Travel Trailer. McCall has good restaurants and services. The backcountry of Idaho is a short drive away.